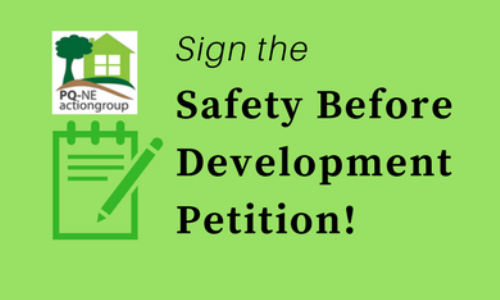 We, the undersigned, are opposed to the development of the former Doubletree Golf Course/Designated Open Space that reduces the public health and safety in the surrounding community, and contributes to what are already unsafe conditions. The adjacent community in northeast Rancho Penasquitos (also known as The Glens) of 1,500 + living units and an elementary school is surrounded by Black Mountain Open Space Park which includes landmark hillsides characterized by rugged terrain of highly flammable indigenous vegetation which has been designated by the city of San Diego as a “Very High Fire Hazard Severity Zone." This area has a history of recent fires that have led to mandatory whole-community evacuations – three (3) in recent memory. The community is uniquely and minimally served by Penasquitos Drive, a single lane out of the neighborhood to evacuate all 1,214+ homes, 224 apartment units, 64 townhomes and the students and staff of Rolling Hills Elementary School, and one lane in for emergency responders/Fire Trucks and school buses needed to evacuate the school in the event of another wildland fire or similar emergency. The addition of the proposed 500+ homes, directly into the evacuation queue, would significantly reduce the performance of the only emergency evacuation route. Adding 500+ homes into a single route serving 1,500+ living units will greatly endanger the existing residents in the community and the students and staff at the elementary school.